Premiered at the Tribeca Film Festival this past April, Super Duper Alice Cooper is the first ever "doc opera" film, presented with a dizzying blend of documentary archive footage, animation, and rock opera. The film was also screened in theaters nationally in late April. Super Duper Alice Cooper is the story of Vincent Furnier, a preacher's son who struck fear into the hearts of parents everywhere as the ultimate rock star of the bizarre, Alice Cooper. Yet beyond the make-up, there is a richer, deeper story. Presented here is the twisted tale of a teenage Dr. Jekyll whose rock 'n' roll Mr. Hyde almost kills him. Through the advent of Alice as front man of a rock band group of Phoenix misfits in the 60s, to the hazy decadence of celebrity in the 70s, to his triumphant comeback as 80s glam metal godfather, the film reveals how Alice and Vincent battled for each other's souls, and how these two opposite characters came to co-exist within one mind. Alice's story is told not only by the man himself, but through exclusive interviews with members of the original Alice Cooper band, Elton John, Iggy Pop, John Lydon, and Dee Snider. 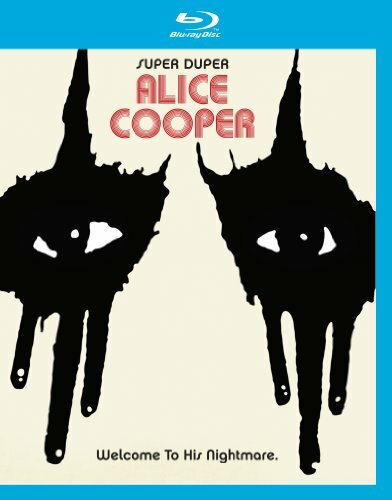 The DVD and Blu-ray version of Super Duper Alice Cooper includes bonus deleted scenes, Alice Cooper interviews from the VH1 Classic series "Metal Evolution," and additional rare footage. The Deluxe Edition features not only the full film on DVD and Blu-ray, but also a second DVD of previously unreleased concert footage from Montreal University in 1972, and a CD of Cooper's performance at the 2009 Montreux Jazz Festival, all housed in an LP-sized box with 60-page hardback photobook. programming for DVD, Blu-Ray, TV, Audio and Digital Media in the world. Eagle works directly alongside talent to produce top quality, High Definition and 3D programs, both concerts and documentaries, including The Rolling Stones, Pink Floyd, The Who, Queen, The Doors, Jeff Beck, U2, Peter Gabriel, Paul McCartney and Ozzy Osbourne. Eagle is a Grammy Award winning company and has received over 30 multi-platinum, over 50 platinum and over 90 gold discs, worldwide. Eagle Rock Entertainment has offices in London, New York, Toronto, Paris and Hamburg.